A coaster to illuminate a drinking glass which also contains a timepiece for indicating the time. The surface on which the drinking glass rests has a photoluminescent effect which provides illumination in darkness. The current embodiment uses a clear flat surface under which a photoluminescent clock face is located, the gap between the glass and clock face housing the hands of the clock. The invention is primarily for use on a bedside table for people who take a glass of water to bed. The performance of the photoluminescent material is selected such that under normal lighting conditions the device will provide illumination of the glass of water and the clock face exceeding 30 hours in darkness. The photoluminescent material charges under natural and/or artificial light and the upward illumination provided identifies clearly the meniscus of the drink and therefore the level to which the glass is filled. See Link for product details. Open to any offers for outright sale or royalties. Product fully developed with manufacturer in Hong Kong/China. No specific conditions for sale, contact to negotiate. The design is also registered. 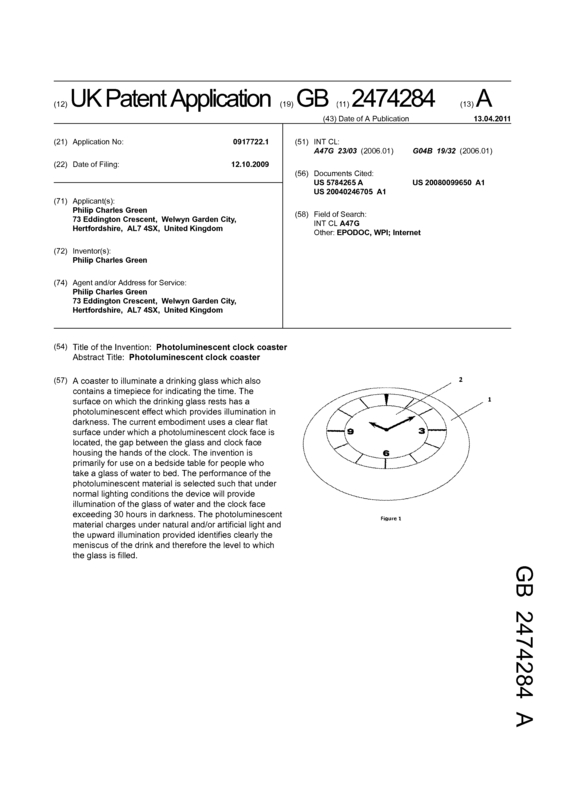 Page created at 2019-04-24 18:49:52, Patent Auction Time.